In preparation for a visit by Canadian author, Deborah Ellis, two classes of 12 year olds worked with me in the library to research some of the issues which form the background of her recent novels. 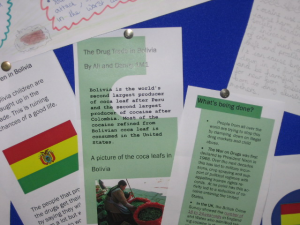 The Taliban rule in Afghanistan and drug production in Bolivia may not have been the cheeriest topics, but gave the opportunity for some really in depth research on topics which these pupils would never have encountered in their everyday lives. They produced leaflets and posters which formed a backdrop for Deborah’s visit and she was most impressed. Most importantly their newly acquired informed-ness made for great question and answer sessions. There was the usual “What was your favourite author when you were young” questions; but there were also many more questions about her travels and her campaigning for young people, disadvantaged by social and political situations. A small group of pupils also interviewed Deborah for the latest issue of “Teen Titles” too and their recorded interview was so in depth that it had to be whittled down to a three page spread! 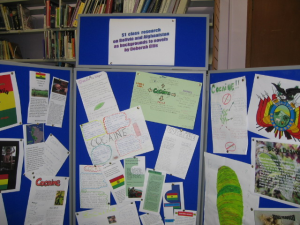 So everyone was happy: the pupils were better informed and could ask meaningful questions of the author; the English teachers got some reading for information work to assess; and I saw some really solid research which I wrote up in the Library blog. Deborah was really delighted at the pupils’ interest, which added to the experience of an author visit for her.